(There is no requirement to post signs at right turns saying, "stop before turning" or something like that. 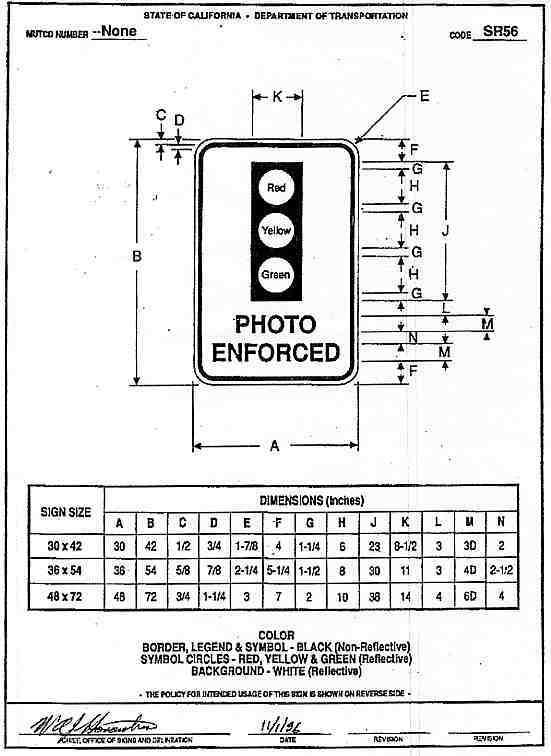 Until Jan. 1, 2013, the Vehicle Code (excerpted below) required the posting of warning signs like the one depicted below, "visible to traffic approaching from all directions" at each camera-equipped intersection, or at all the main entrances to town. Most cities posted enough signs but not all signs complied with the CalTrans specifications - particularly as to the minimum size of 30 x 42 inches. Here are some of the other laws about road signs. CVC 21465. No person shall place, maintain, or display upon, or in view of, any highway any unofficial sign, signal, device, or marking, or any sign, signal, device, or marking which purports to be or is an imitation of, or resembles, an official traffic control device or which attempts to direct the movement of traffic or which hides from view any official traffic control device. CVC 21467. Every prohibited sign, signal, device, or light is a public nuisance, and the Department of Transportation, members of the California Highway Patrol, and local authorities are hereby authorized and empowered without notice to remove the same, or cause the same to be removed, or the Director of Transportation, the commissioner, or local authorities may bring an action as provided by law to abate such nuisance. You can also download two clearer versions of this chart, as follows. This document is not yet available on the CalTrans website. If "your" city has undersized signs and you are going to raise that issue in court, you will need to be prepared to deal with the following sort of reasoning by the judge: During a Sept. 2003 trial of a ticket issued before Culver City's March 2003 posting of full-sized signs, Comm. Amado ruled that (overall) size doesn't matter - since the picture of the signal and the lettering on the then-undersized signs were the same size as those required for the full-sized signs, the fact that the overall dimensions were too small would not matter. Judges in other towns may see it the same way - or differently, of course. Culver City: During the Aug. 5, 2004 trial of a ticket issued at Sepulveda / Machado in Culver City the defendant pointed out that there was no warning sign on the large driveway (for a housing complex) that makes up the 4th side of that intersection. Comm. 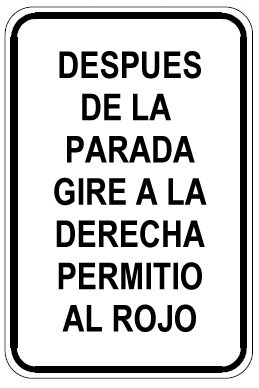 Amado ruled that it is not required to post signs facing traffic coming from private property. Here is an August 2003 CalTrans letter giving their official position about sign requirements. If you want to use this letter in court, you'll need to call CalTrans and get them to mail you a paper copy with a signature in ink. Such a letter isn't hearsay when it's from a government official. It comes under an exception called official writings. The exception is necessary so that high government officials don't have to spend all their time testifying about government policy in courts all over the place. Flex your power! Be energy efficient! I am responding to your telephone call about the PHOTO ENFORCED (SR56) sign. I hope the following information will be helpful. The California Department of Transportation (Department) is responsible for developing standards and specifications for traffic signs. For the last 5 years I have been in charge of the Signs and Work Zones Branch, which designs official traffic signs for use on all public roadways in the State of California. California Vehicle Code (CVC) Section 21400 provides that the Department shall, after consultation with local agencies and public hearings, adopt rules and regulations prescribing uniform standards and specifications for all official traffic control devices placed pursuant to the provisions of the CVC. CVC Section 21401 provides that only those official traffic control devices that conform to the uniform standards and specifications promulgated by the Department shall be placed upon a street or highway. Cities and counties, not the Department, are responsible for installing signs on local streets and roads. CVC Section 21100 (d) allows local authorities to adopt rules and regulations for regulating traffic by means of official traffic control devices meeting the requirements of CVC Section 21400. CVC Section 21351 allows local authorities to place and maintain such official traffic control devices. There is no requirement to post signs at right turns saying, "Stop Before Turning" or something like that. 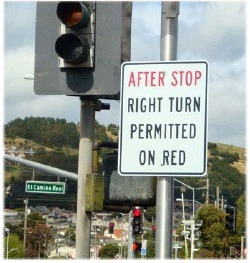 If there was such a requirement, there would have to be four such signs at every signalized intersection in California. So, the requirement is simply something you are supposed to know, and is part of the written driving test. If a city decided to make up their own signs saying "Stop Before Turning" or "After Stop, Right Turn Permitted on Red," they would be in violation of CVC 21401 and 21465 (above). If you could swear that you have seen such a sign, you may have been to South San Francisco, or Millbrae. At an intersection where rolling right turns are a major safety problem and camera enforcement has failed to reduce the violations, and at those few locations where it's necessary to prevent all right turns during the red, the city should install a Blank Out sign. 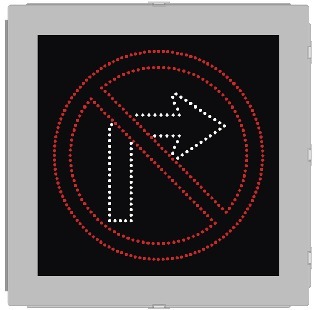 Blank Out signs are large (24" x 24" or bigger) electrically-powered signs whose messages are not visible when the power is off. Thus, they provide the ability to prohibit right turns during selected portions of the signal cycle. 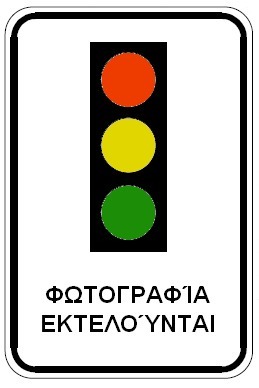 This Blank Out sign has the added advantage that its message is not in English - see Why Not in Greek, below. · In advance of photo-enforced intersections. · At photo-enforced intersections, typically on the far side traffic signal pole. · On all approaches into an area where red light camera systems are used for red light running. Warning signs placed on all approaches into an area, while used to satisfy legal requirements in some jurisdictions, are appropriate as supplemental warning signs but not as the primary warning for motorists. Advance warning signs should be installed at photo-enforced intersections. All advance warning signs should be clearly visible and compliant with the MUTCD (17). Sign Placement - New (MUTCD) Guidance. We have a lot of tourists in California, and due to the State's size and general lack of a public transportation system many of them rent cars and drive. The two signs above were made up by highwayrobbery.net. We are sure that in Greece and Mexico, the warning signs use international symbols that can be understood by all nationalities. Here is a sign not made up by highwayrobbery.net. 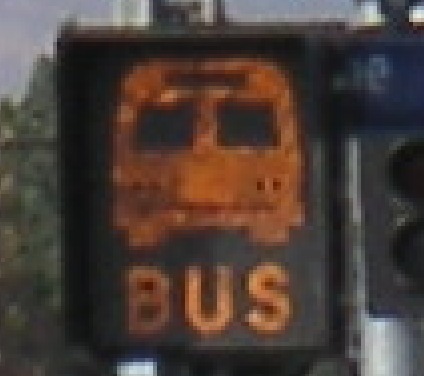 This Blank Out sign has been set up to flash, in an effort to prevent motorists from making right turns on red across Metro's Orange Line busway in Los Angeles. But it hasn't been effective, probably because it depends upon the motorist's understanding of an English word and also fails to tell the driver what to do, or not to do (don't turn right). Further, it is an unapproved sign (not listed in CalTrans' MUTCD), so exposes Metro and the City of LA to liability in the event of an accident.